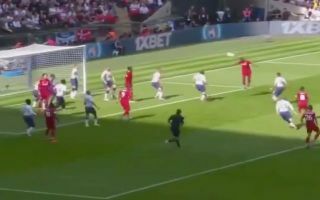 After a bright start, Liverpool eventually found their breakthrough against Tottenham with Georginio Wijnaldum’s header putting them ahead at Wembley. The visitors looked dangerous in the opening stages as they had a goal ruled out less than a minute in for offside, but they continued to threaten thereafter. Spurs did start to gain a foothold in the encounter as the half went on, but just as they began to drop off the pace again, Wijnaldum took advantage of some poor defending from a corner to send a looping header towards goal. Having evaded the man on the line, Michel Vorm could only parry it away after it had crossed the line, with referee Michael Oliver awarding the goal with a helping hand from goal-line technology. In turn, Liverpool will be pleased with how they’ve managed to take the lead and looked comfortable for the most part, with Spurs not really creating any dangerous moments of note in the opening 45 minutes. It’s the Dutchman’s first away goal in the Premier League, and it may well turn out to be a particularly important one if it helps them maintain their perfect start to the new campaign.